These cookies weren’t originally in my plans. 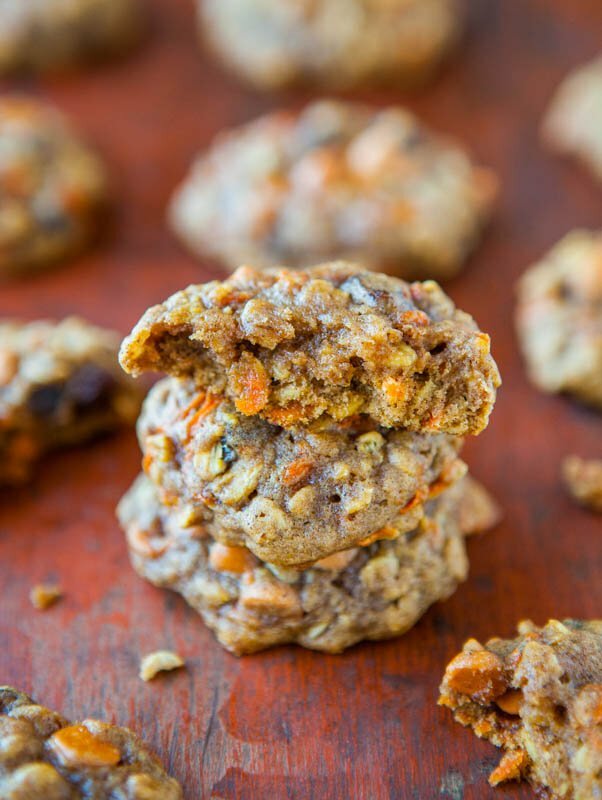 They’re the result of a carrot muffin failure. I was so disgusted that I couldn’t even bear to re-make the muffins. So I made cookies instead. Best call ever. I had filled muffin cups to almost three-quarters full in an effort to get big puffy domed-top muffins. Unfortunately, what emerged from the oven were mushrooms, not muffins. Their tops sat flush on the pan and although they tasted fabulous, it was one big wall of conjoined muffin tops. Shudder. The cookies more than make up for the muffins, and if I had to choose, cookies trump muffins anyway. They’re supremely moist, soft, and chewy without being cakey. I like my cake to be cakey, but never cookies. 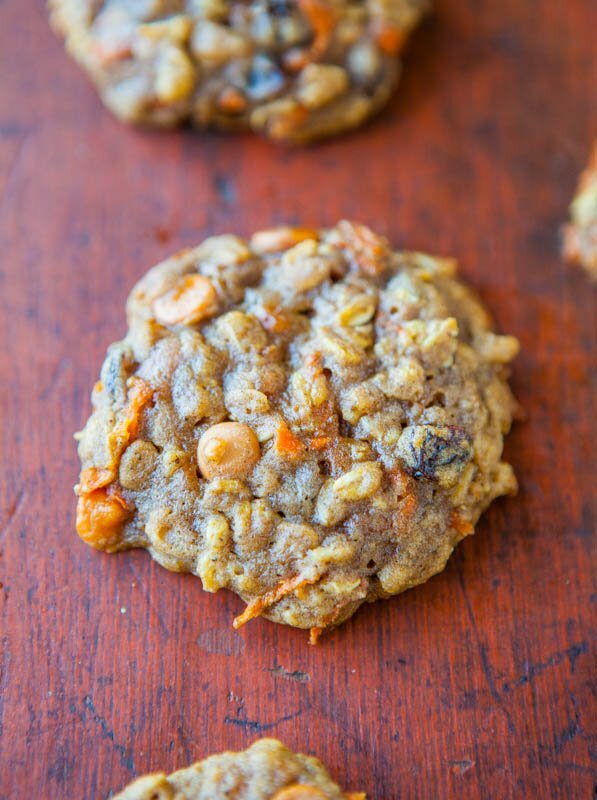 They’re loaded with texture from the carrots, oats, raisins, and butterscotch chips. If you don’t like raisins or butterscotch, and prefer nuts and white chocolate, or nothing at all other than just carrots, suit yourself. I’m a raisin lover, and after last week’s Oatmeal Scotchies, I’ve also been on a major butterscotch kick. 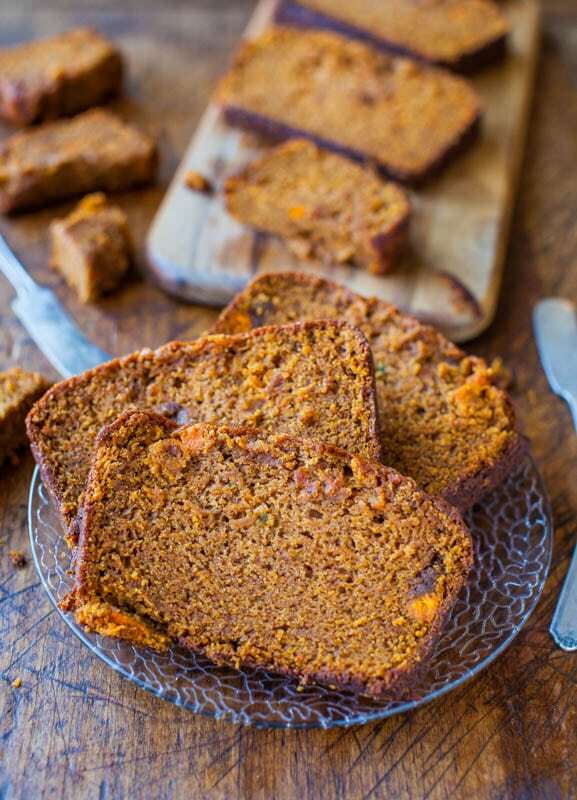 Bland carrot cake is so unappetizing and as I mentioned when I made Carrot Cake and Cinnamon and Spice Sweet Potato Bread, orange vegetables can stand up to a lot of spices without becoming overpowered. In fact, they necessitate a heavier hand when adding spices. 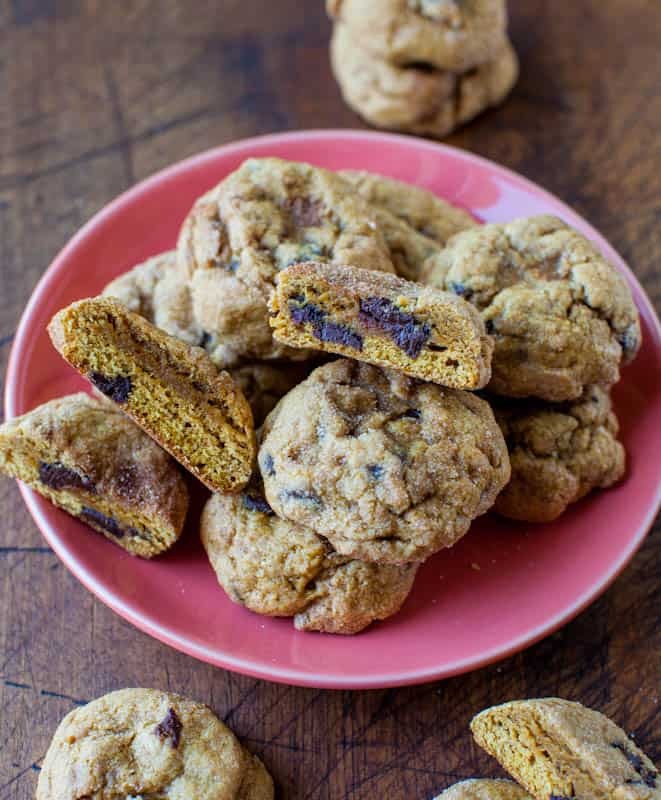 The cookies are pleasantly spiced, and just robust enough, but not overdone. Or course, season to taste based on your preferences. I prefer to grate the carrots by hand with a box grater using the coarsest blade. It’s three-quarters of a cup, about two medium carrots, and takes one minute. Bagged shredded carrots from the grocery store just aren’t the same and it isn’t a job worthy of dirtying my food processor. I measure them by loosely piling them into a one cup measure, and as long as it’s at least three-quarters full, or a skimpy one-cup, that’s ideal. After the dough comes together, use a medium 2-inch cookie scoop to form mounds and place them on a large plate. The dough is soft and messy and being able to dig into the mixing bowl as if it were a bowl of ice cream, using a scoop, is so much neater and easier. Because this dough is soft, it must be chilled for at least 3 hours, overnight, or up to 5 days before baking. Do not bake with warm dough or the cookies will spread. If you want thick cookies, you must chill the dough. Plus, chilling it gives the spices and flavors time to marry. Bake for 9 to 11 minutes, however I strongly recommend the lower end of the range. The cookies firm up considerably as they cool, so don’t be afraid to pull them even if the tops look glossy and under-done. Overbaking will turn these softies in rocks, with overly browned bottoms. I figure since there’s vegetables baked into them, a few extra cookies means a few extra servings of vegetables. Normally I don’t include nutrition information, but after scarfing three warm cookies off the baking tray, without feeling like a lead balloon had landed in my stomach, I was curious about their stats. 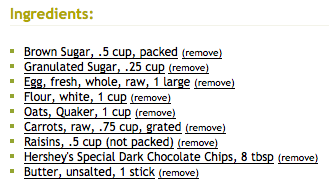 I inputted the major ingredients into this site and used 22 as the servings since I made 22 cookies. Butterscotch chips weren’t listed an option so I used dark chocolate chips instead. However, I believe they artificially elevated the stats because dark chocolate is fattier and more calorically dense than butterscotch. If the optional raisins and baking chips were omitted, it would be less. But carrot cake isn’t carrot cake without raisins and I love butterscotch. And I will always eat cookies based on taste, not on stats. It’s a cookie; it’s not supposed to be healthy. If if happens to be, great; but if not, oh well. The cookies are a new favorite and are some of the best cookies I’ve made all year, and I bake a new cookie recipe nearly every week. I’m also still madly in love with these. 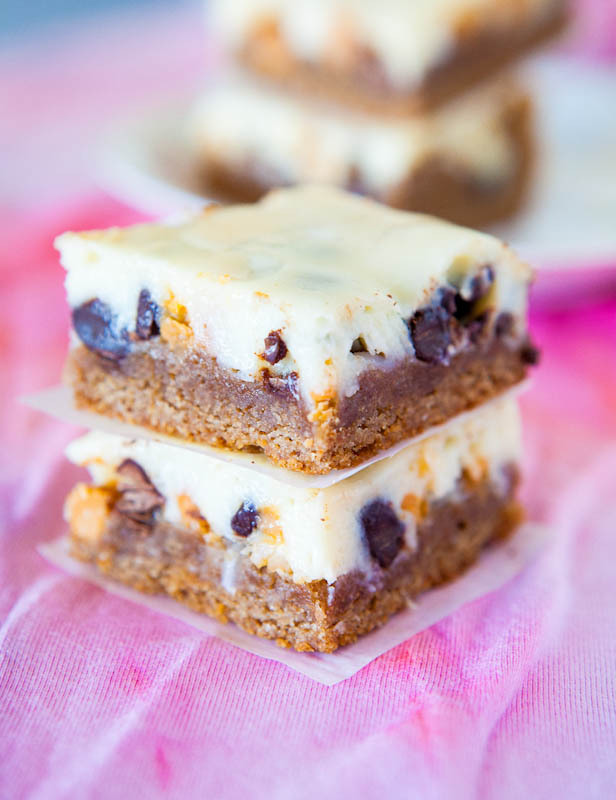 In large part due to the spices used, they remind me of a perfect slice of carrot cake, minus any cakiness, and I kept reaching for one more. One more. They have soft, tender interiors with chewy edges. They stay moist for days and get softer the second and third day because brown sugar is hydrophilic (absorbing atmospheric moisture), rather than drying out. 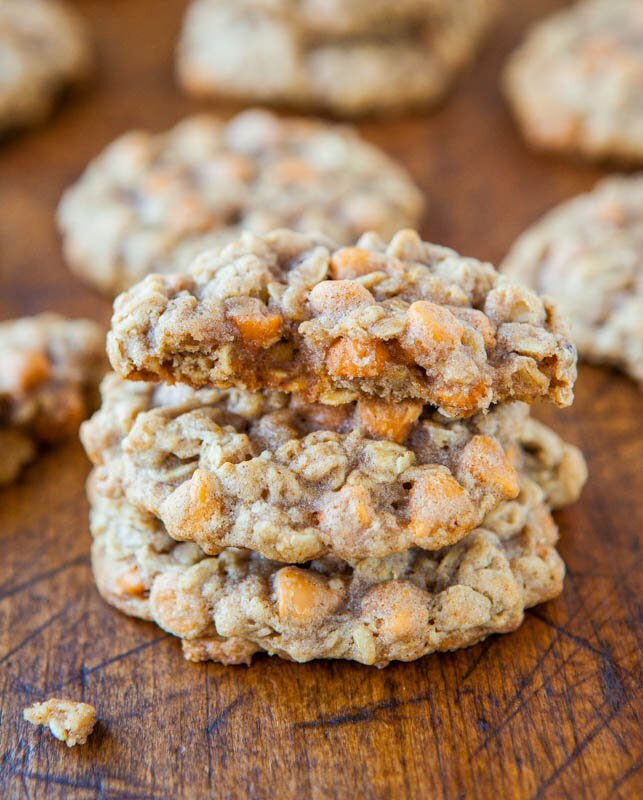 Juicy raisins, oats, carrot shreds, and sweet butterscotch chips lend so much chew factor and texture. I live for those thick, dense, loaded-up bites. 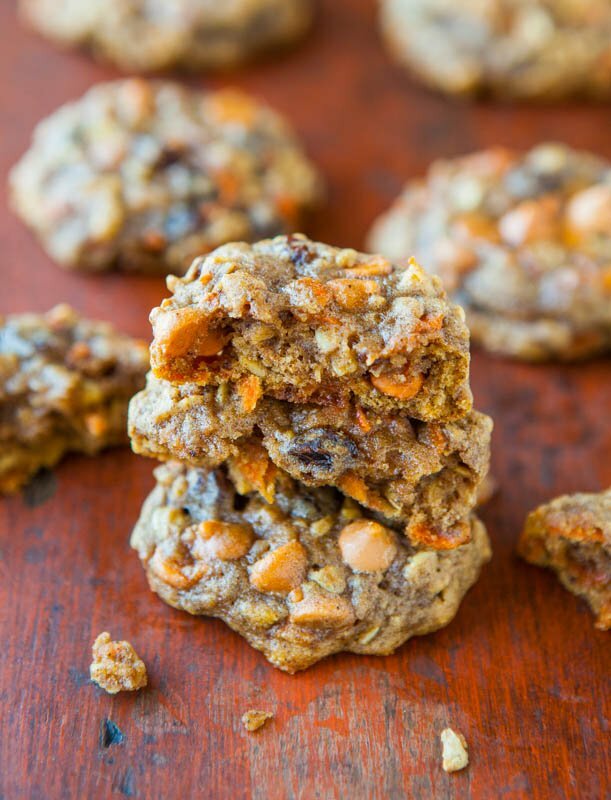 All the flavors of richly spiced carrot cake, in cookie form. 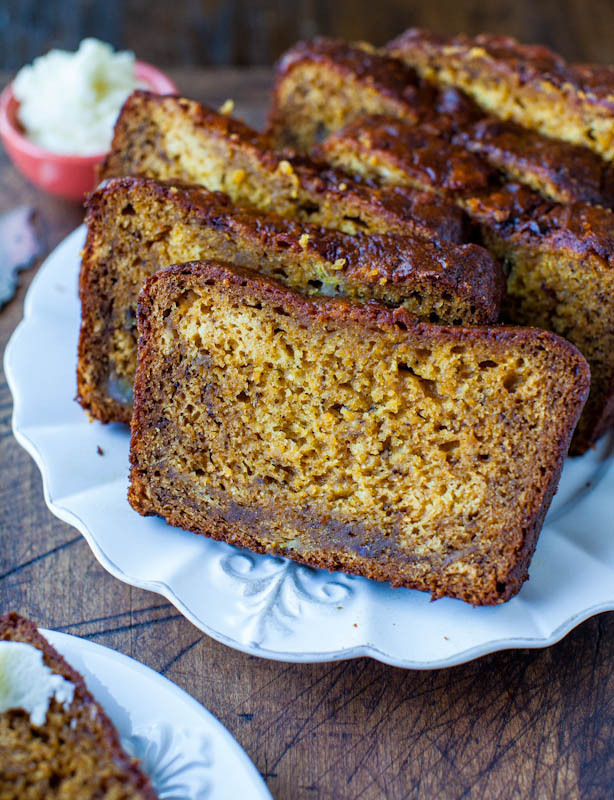 Soft, chewy, extremely moist, and not at all cakey. 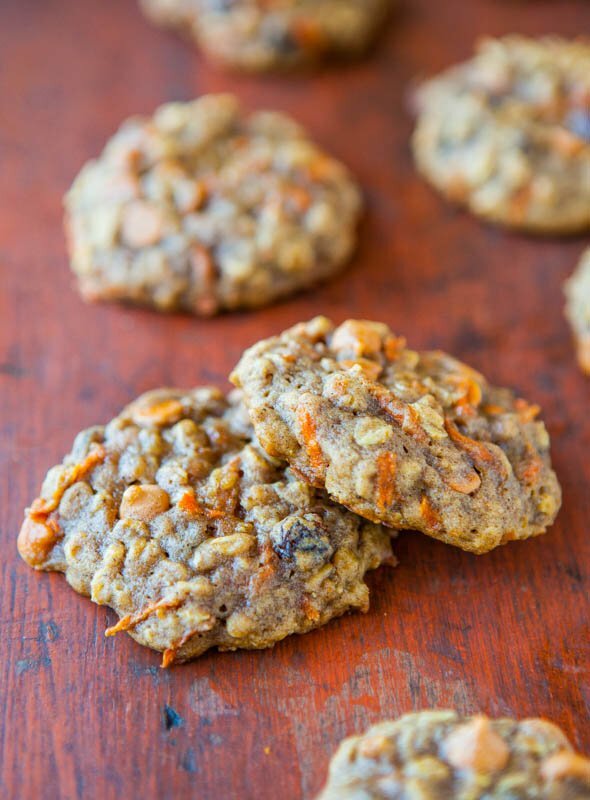 They’re loaded with texture from the carrots, oats, raisins, and butterscotch chips. 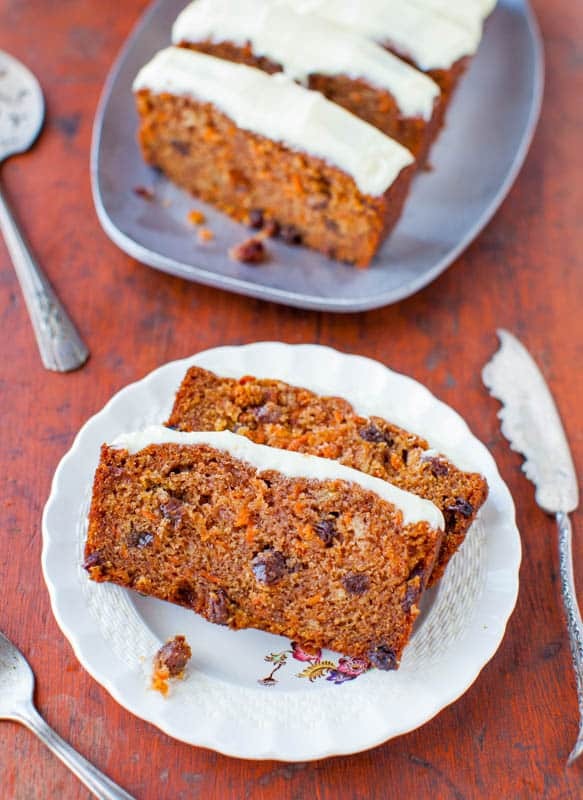 If you prefer your carrot cake without raisins or butterscotch, feel free to omit. 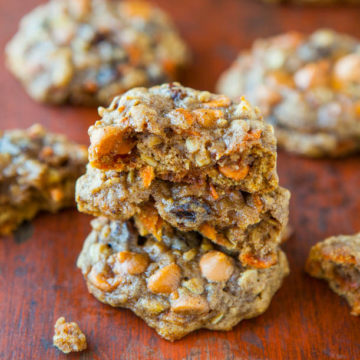 I love the juicy pop of the raisins and the sweet, butteriness the butterscotch chips lend. 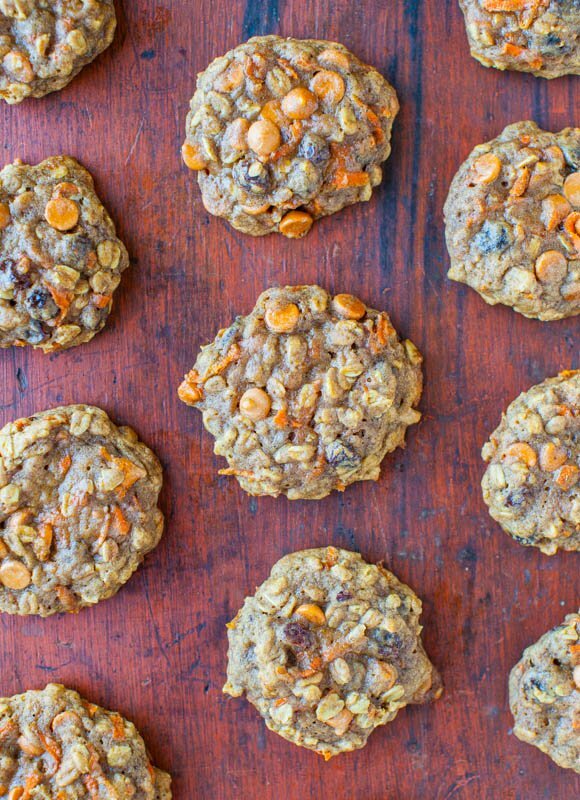 As cookies go, theyr’e on the healthier side, and one of my new favorites. They’d also make great sandwich cookies filled with cream cheese frosting. To the bowl of a stand mixer fitted with the paddle attachment (or large mixing bowl with hand mixer), combine the egg, butter, sugars, vanilla, and beat on medium-high speed until light and fluffy, about 5 minutes. Stop, scrape down the sides of the bowl, and add the cinnamon, allspice, nutmeg, cloves, optional salt, and beat momentarily to incorporate. As written, cookies are pleasantly spiced and robust, without being over-spiced, but dial down the amounts as written and adjust to taste if you’re particularly sensitive. 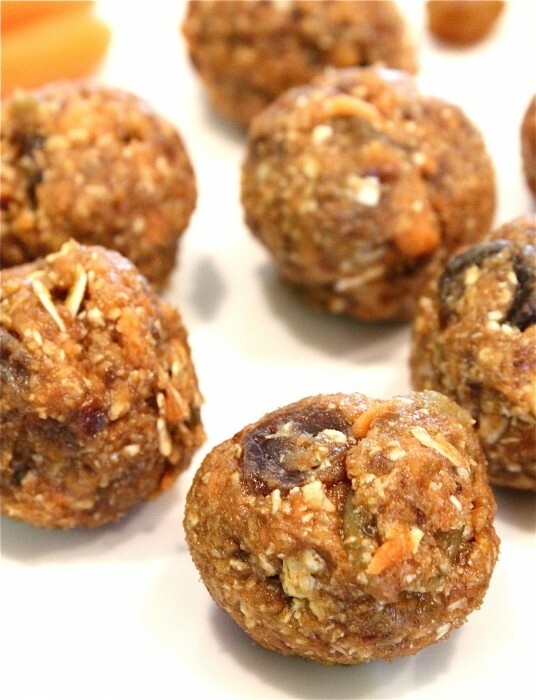 Add the flour, oats, baking soda, and beat until just combined, less than 1 minute. Add the carrots and beat to incorporate, about 30 seconds. 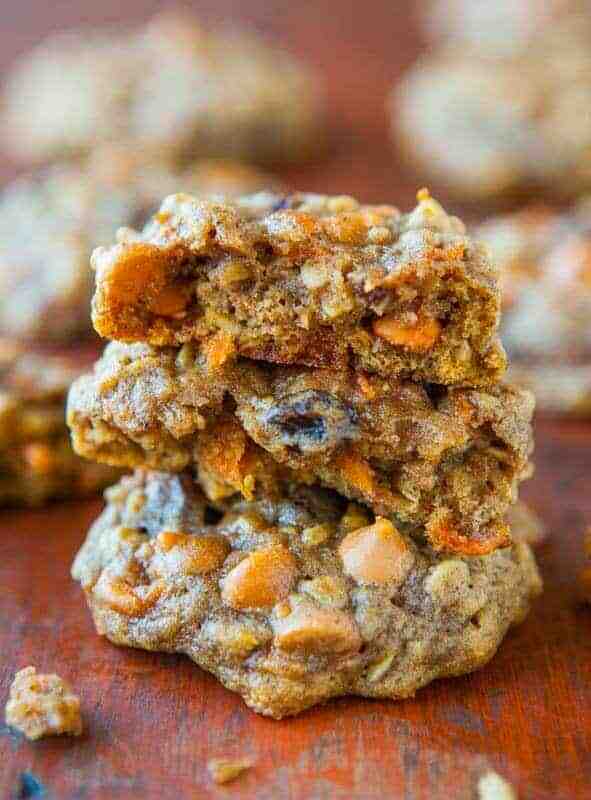 Add the optional butterscotch chips, raisins, and beat to incorporate, about 30 seconds. Using a medium cookie scoop (about 2 tablespoons) or your hands, scoop out mounds of dough (I made 22) and place them on a large plate. Flatten mounds just slightly with heel of your hand. Cover plate with plasticwrap and refrigerate dough for at least 3 hours, up to 5 days, before baking. Dough is far too soft and moist, and is unsuitable for baking until it’s been chilled or cookies will spread dramatically. Preheat oven to 350F, line 2 baking sheets with Silpat Non-Stick Baking Mats, parchment, or spray with cooking spray; set aside. Space dough 2 inches apart (8 per tray) and bake for 9 to 11 minutes (I recommend the lower end of that range), or until tops have just set, even if slightly underbaked and glossy in the center. Cookies firm up as they cool, and baking too long results in cookies that set up too crisp and hard with overdone undersides (The cookies shown in the photos were baked for just over 9 minutes, with trays rotated at the 5-minute mark, and have chewy edges with pillowy, soft centers). Allow cookies to cool on the baking sheet for about 10 minutes before removing and transferring to a rack to finish cooling. Store cookies airtight at room temperature for up to 1 week, or in the freezer for up to 3 months. Alternatively, unbaked cookie dough can be stored airtight in the refrigerator for up to 5 days, so consider baking only as many cookies as desired and save the remaining dough to be baked in the future when desired. Do you like carrot cake? 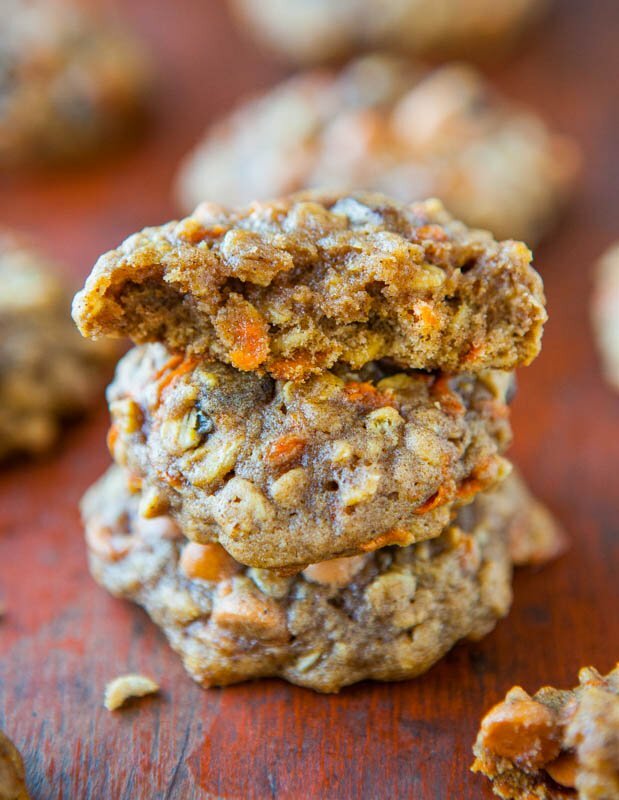 Ever tried carrot cake cookies? 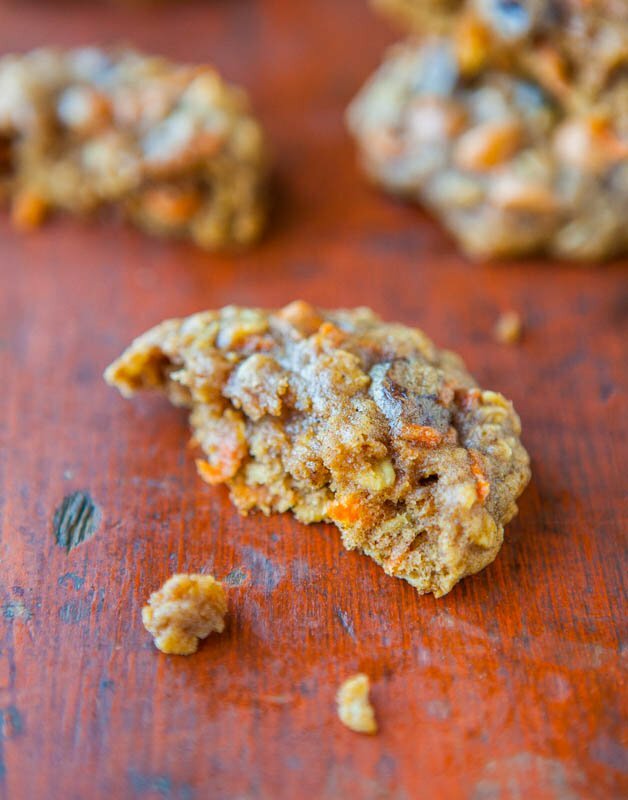 I love carrot cake and the overall spices used, but was leery of making carrot cake cookies. I didn’t want a cakey cookie, and I am thrilled with how these came out. The carrot muffin failure was a blessing in disguise.